Early November a new book about the Westwall was published. It’s not about the defence line as a whole, but about a particular part of it, the naval gun batteries in the Upper Rhine valley. I talked to one of the authors of the book, Sascha Kuhnert, to find out how the Kriegsmarine guns ended up at the French-German border. First Sascha, tell me something about how you ended up writing this book. Where did your interest come from? I am born directly at the German/French border of the upper Rhine valley and basicly grew up just a few hundred meters next to the river Rhine, and the remains of several bunkers of the German Westwall opposite to the French City of Strasbourg. In the beginning when we were kids the bunkers were our best playground, even or maybe especially because it was forbidden by our parents. Later I got interested in the history of those bunkers as well as that of our village. Already as teenager I started to speak with old people and was writing down what they knew. Our village was evacuated in the summer of 1940 during the attack on Alsace by the German 7th Army, because it was too close to the river front line. 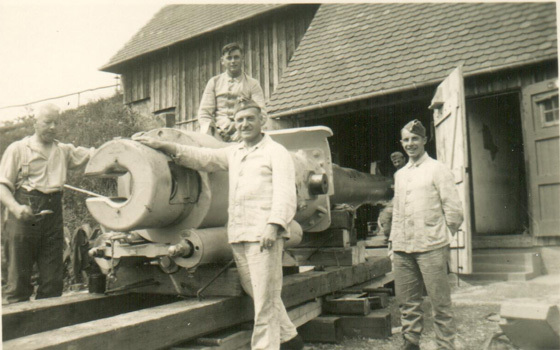 The whole village was moved next to the 24cm Batterie Maisenbühl-Oberkirch, and was watching how they came in action. I heard about this battery and others the first time through the stories of the old people in my village. I joined a local history club and so I met an ex member of the 17cm Batterie Urloffen in a neighbouring village. He happily told me his whole story in several meetings, which was great because he had been with the 17cm guns at the Westwall and moved with them to Channel coast near Calais. In fact he stayed their during the rest of the war until he became a British prisoner of war in 1944. He was the first, and one of the best sources I found. Nobody was really interested in his story or to see all the great pictures he had. I got fascinated about all this and here I got the first time the idea of writing a book about the subject. The story and pictures of this man can be found in the book. At the same time I joined the German fortification study group “Interfest” to know more about the history of the Westwall and I also became a member of the “Arbeitskreis Westwalltag”. It was a time when the Internet was still really non-existing and it was much harder to obtain historical information. Here I met Friedrich Wein who was living nearby and had the same interest. He also had more information about many of the other naval batteries in our area. We became friends and started on the book project. That was more than 10 years ago. How did the Kriegsmarine end up far away from the seas, in the Oberrhein area? This is basically the hot point of the whole story and also an explanation for many other questions. It all started in 1938 before the Munich Agreement and the fall of the Czech republic. Hitler was planning to attack the Czech republic with all his forces. At this time the German army was not able to fight a war on two fronts. The Westwall, which was just started to be constructed and was still nothing more than a loose and thin line of a hand full of bunkers. Especially at the Upper Rhine valley the situation was very bad and it was estimated that an enemy breech could be realized after only 3 days. Hitlers idea was to strengthen this weak area with heavy artillery which should threaten French cities in the Elsass in case of an attack of the Allied forces. The big problem was, that the German Army (Heer) didn’t have such long range guns, because of the Treaty of Versailles. This treaty had the biggest impact on the German army and air force and during the 1930s they were just in the early beginning of their reinforcing. There were not enough new guns and the ones available had too little range to do the job. The German Navy however was the only force in Germany which was allowed to use large calibre guns, to protect the German coast line. The Versailles Treaty saw a pure defence in those coastal guns because the German coast was too far from the next neighbouring countries compared to the range of these guns. And of course it was not allowed to use them anywhere else than there, at the German coast. So Hitler’s personal order to the Kriegsmarine was to borrow naval guns which had the necessary range and which were not needed in any new navy project. There was basically nothing else available than old naval guns which had been built before World War One. The Navy had to obey and even support the Army with supply, troops, ammunition and specialists to install and use the guns in the upper Rhine valley. The Navy had to act like the Army was in charge and the whole project was personally watched by Hitler himself. Hitler ordered that the guns should be ready for action in October 1938 because that was the moment when he planned the attack on the Czech Republic and the expected Allied attack in the West. Time was too short to build any bunkers and so all the naval guns were just placed in open gun emplacements on top of simple concrete platforms. Was the planning of Kriegsmarine fortifications any different from the Heer fortifications? After the Munich Agreement of September 1938 and the danger of an Allied attack was over, the Navy got the order to leave their guns at the Upper Rhine Valley until the summer of 1939 and at the same time move all navy soldiers back to the coast. Only a very few specialists still remained as instructors with the guns. Hitler now planned the attack on Polen and needed even more and stronger fortifications on the western border. He cancelled all the actual bunker projects and orderd the “Limesprogramm”, which we are calling the Westwall today. Much more and stronger bunkers were built, and in closer range to each other. The naval guns were supported by own bunker types,- designed by the German fortification pioneers (Festungspioniere). The German navy never really had any influence in the construction and the design of those bunkers. The heavy strength of the Westwall bunkers for the naval guns (in the use of the army) was completly Hitlers idea. He first came up with the idea for 3,50 m thick concrete walls and roofs. 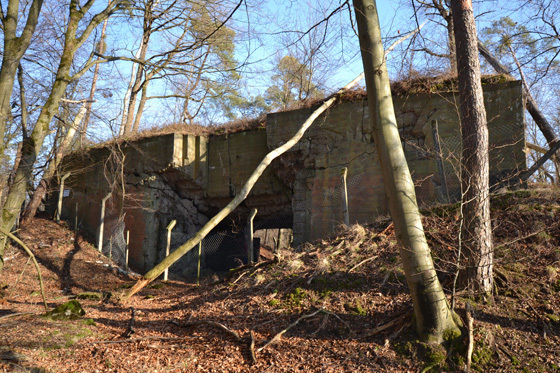 This was also the first time bunkers in the Baustärke A (3,50m) were planned and built in the Westwall. So on that moment Baustärke A was born, because of the personal fear of Hitler of an Allied air raid against the naval batteries close to the French border. The bunker designs were officially part of the “Limesbauprogramm 1938” and named as “Regelbauten” (Regelbau 30, 30a, 34, 35, 36). 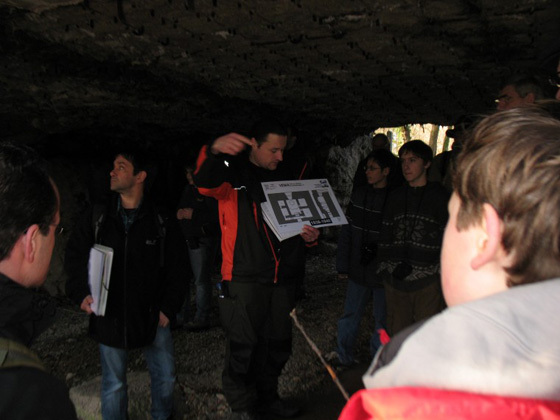 Can you describe the camouflage of some of these casemates? Because the design of the bunkers was determined by the guns, the camouflage of all naval gun battery’s bunkers in the upper rhine valley was determined by the surrounded countryside of the area in which they had been built. Thus the camouflage was very different, varied and also changed in a few cases by the seasons and times. Chopped young trees were fixed at the outer walls of the bunkers. 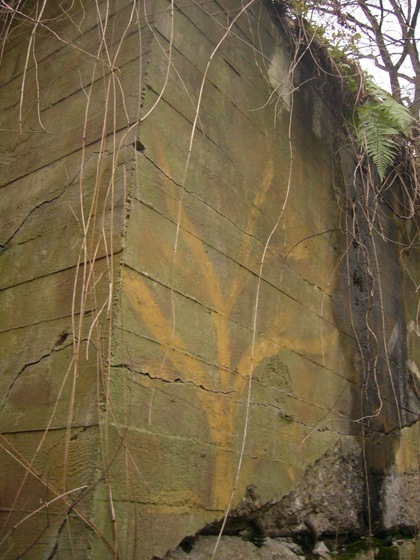 The side walls were covered with earth and long trees were painted at the front wall around the Scharte. Some gun bunkers and also the command and personnel bunkers were covered with a wooden outer layer of a fake house or farm building. For example a barn, a farm house with stable at the side, or a typical wooden frame house of the southern German style or, like in the case of the 24cm Batterie Maisenbühl/Oberkirch, in the style of the old “Schwarzwaldhaus” (Farm building of the Black Forest for a big family and cattle). If bunkers in such an area had been covered with earth, they also got a camouflage by nets all over the bunker later. The same happened also at the big 30,5cm naval gun of the Batterie Ottenhöfen. All the fake wooden house boards of the gun bunkers suffered a lot during the firing of the guns and got badly broken. For example the faked roofs almost completely lost their real tiles which fell down and broke. The cover for the huge gun Scharte, which was a big gate running in rails (like at a garage for big vehicles) got lifted out of its rails and broke completely. So by firing more and more rounds, the camouflage was completely stripped. Were the batteries actually put to action anywhere in the war? Oh yes they did. Almost all of the batteries came to action and were shooting at french cities (Hagenau, Strassburg, Colmar, Selestatt, Mühlhouse) from May 16 to June 18 1940. The firing mostly took place during the attack on the Alsace by the 7th German Army (General Dollmann) over the Rhine at the Operation “Kleiner Bär” from 15.6 – 18.6.1940. The naval guns of the Westwall mainly supported this attack. All together about 3200 rounds were fired by the naval batteries during this period. A detailed scheme of the time and the targets and also the reasons why the guns fired is outlined in our book. What happened to them after the Blitzkrieg of 1940? The guns were taken out of the bunkers by the gun crews themselves. Most of the crew members were sent to the French coast with the guns, back to the responsibility of the Kriegsmarine. The empty bunkers remained at the upper rhine valley, got locked and were watched (not guarded) by older reserve soldiers from the villages nearby. They acted more like some kind of official caretaker for all the Westwall bunkers in their area. In the late autum of 1944 orders had been given to reinforce these bunkers with new and modern guns, this time from the army. These works went very succesful for the two bunkers of the ex. 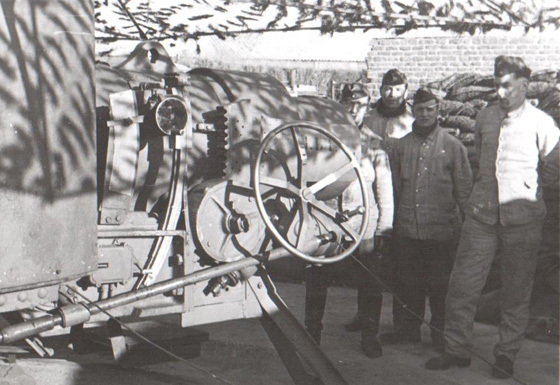 24cm Batterie Maisenbühl/Oberkirch, but failed for the 17cm batteries. No information is known of any new use of these ex. 17cm bunkers or the finishing of the rearming work. 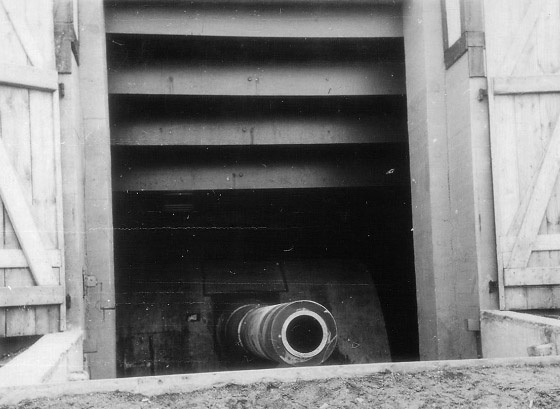 Both old 24cm gun bunkers received new 21cm Kanone 52 (Also known as V3) from Skoda and came to action by shooting on Strassburg and later supporting a German counterattack over the Rhine as part of Operation Nordwind in January 1945. After the occupation of the Upper Rhine valley by the First French Army in April 1945 the first bunkers which were systematically blown up and stripped of all their metal parts were the bunkers of the old naval batteries. Only three ruins of all the twenty gun bunkers are left nowadays and are in bad shape but still visible. Furthermore several smaller objects are still to be seen but difficult to find like small bunkers for the communication system, the water supply and remains of barracks. Not for the few remains of the batteries. There are only some interesting ruins at the last remaining battery near Karlsruhe. We (Friedrich Wein and me) are now trying to raise public interest for this difficult part of German history and think of offering free guided tours a few times a year for everybody. We also try to prevent the few ruins from further destruction through raising this extra awareness. As a matter of fact it is just pure luck, that we received such a huge amount of old original pictures of the gun batteries which had been taken during the war. And because we present those pictures together with the old pictures from the batteries at the French coast, it gives you a better insight and impression of the whole story than text only. 17cm Regelbau 30 guided tour by both authors. Not at the moment, because the last 14 months had been very busy with the writing work of the 638 pages for the book. I just need a bit of a break. I am very sure however, that it was not my last project about the Westwall fortifications in my home area and that I already have a few new ideas. 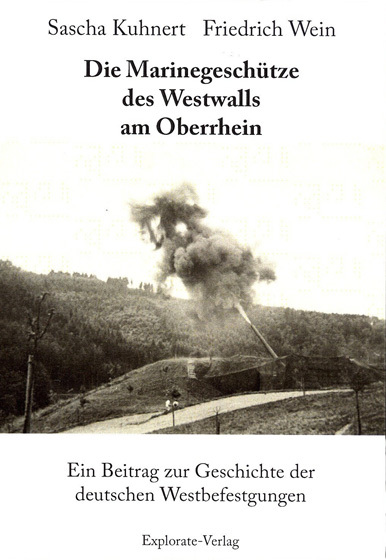 Anyway I am constantly doing research about the Westwall in the Upper Rhine valley from Karlsruhe to the Swiss border. This includes both field work as well as research in various archives to document that part of the last German fortification line in the west of Germany. Thank you so much Sascha for taking the time to answer these questions! It sure looks like an interesting book! The Arbeitskreis Westwalltag organises guided three day tours in special parts of the Westwall once a year. A fantastic publication that illuminates one important, but rather unknown aspect of the Westwall in detail and depth. The authors deserve the respect of all bunker enthusiasts!